French red morocco gilt, ca. 1810. Purchased by J. Pierpont Morgan, 1902. Sale (Sotheby's, London, March 19, 1896, no. 409) to Pickering for Richard Bennett, his Catalogue, no. 62; purchased by J. Pierpont Morgan (1837-1913) with the Bennett Collection in 1902; J.P. Morgan (1867-1943). 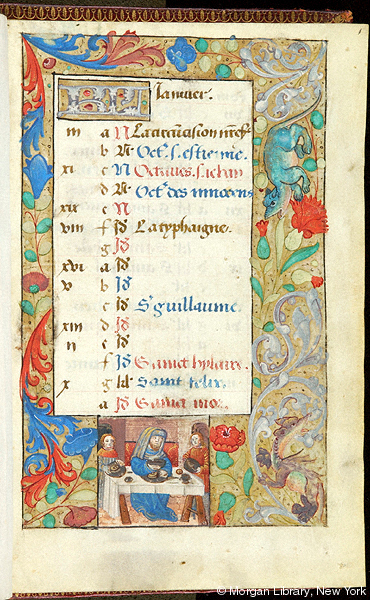 Ms. book of hours for the use of Rouen (Hours of the Virgin, Office of the Dead); written and illuminated in Rouen, France, early 16th century. Decoration: 14 large miniatures, 17 border historiations, 24 calendar vignettes; French Gothic style. Artists: Various Rouenais artists, one from the workshop of the Master of Morgan 85, another closer to the workshop of the Master of Morgan 96.